Ursula made me promise that I would start the story of last weekend’s “snowshoe misadventure” by telling you I made a ton of mistakes. Boy, did I. As I’ve written here, I’ve spoken recently with a whole cadre of “kids and snowshoes” experts — including AMC’s Adventure Programs Manager Sara DeLucia, NH Chapter trip leader Rick Silverberg, and teacher Donna McCusker. That’s gotten me excited about snowshoeing with our children. There’s a difference, though, between hearing great advice (even writing it down), and actually putting it into action, as Ursula can tell you. The first day of the holiday weekend brought us nearly two feet of fresh, light snow; reasonable temperatures; and a little brother away for the afternoon. Ursula was game to join me and Jim for a snowshoeing adventure. My first mistake came in not listening more carefully to what she agreed to. She heard “adventure” and started talking about roasting hot dogs over a fire. I shook that off: My idea was to hike up a steep ridge on the other side of the pond. “Adventure” to me meant getting farther along that ridgeline than I’d gotten before, exploring new territory. I looked at my watch and saw that we had almost three hours before we needed to pick up Virgil. Plenty of time, I thought. Second mistake. The mistakes kept coming. 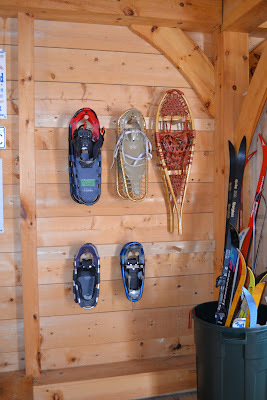 We’ve acquired a ragtag collection of (mostly) hand-me-down snowshoes for the kids. 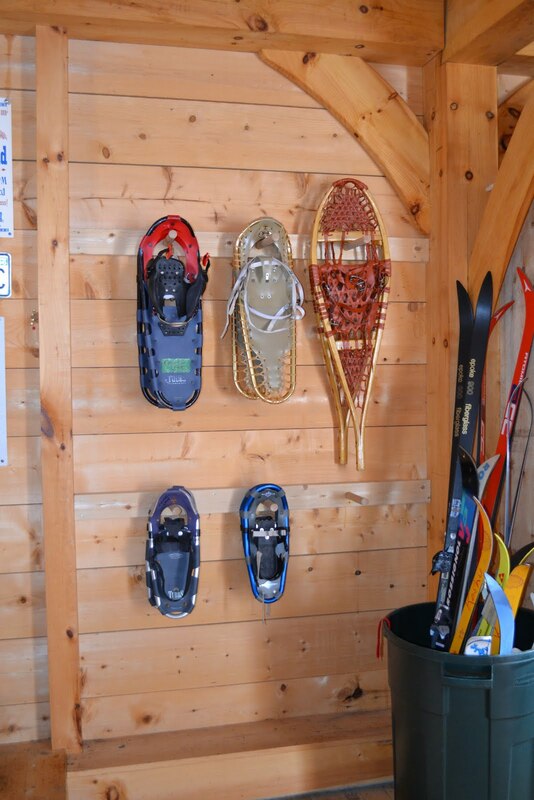 Out in the barn, papa, mama, and two sizes of baby bear snowshoes hung on wooden dowels. “Get snowshoes that fit,” Rick Silverberg had told me, explaining that older kids, like Ursula, often do better with lightweight adult snowshoes than with kids’ sizes. Instead, we wrestled a too-small pair over her snow boots. Bending down and pulling at the straps, I could feel her mood darken. “I don’t like these,” she complained. Her mood lightened, though, as we headed for the woods. She ran up behind me and caught my snowshoe tails, toppling me into the powder. I should have laughed. Instead I snapped at her. I immediately regretted it. Her playfulness receded. Before long she’d flopped down in the snow and wanted to know if we were almost there. We hadn’t even made it to the base of the hill. Luckily, Jim had heard Ursula’s excitement about a fire in the snow and had packed a small axe, matches, hot dogs, and hot chocolate. His promise to build a fire got her partway up the steep ridge. Her mood rebounded again with the hot chocolate, a peeled clementine, and a couple of hot dogs charred over the small flame. By the time we put out the fire and packed up again, it was time to head back down to collect Virgil from the party. • Have the right gear, and make sure it fits. We should check the fit of all the kids’ winter gear — pants and jackets, skis, and snowshoes — before winter gets underway. Ursula is overdue for snowshoes that fit. A decent pair of lightweight adult snowshoes should last her for a long time, and she’ll appreciate the category upgrade. • Bring food. I was ready to go out on a three-hour snowshoe with minimal snack food. Seeing Ursula’s mood improve was a good reminder of the power of food, especially hot food, especially food you can cook right there. • Go with the flow. Once I invited Ursula to snowshoe with us, I needed to readjust my idea of what we’d do to fit her experience level and her interest. Our misadventure wasn’t all bad. Until this weekend, Ursula had done little more on snowshoes than paddle about the yard. When one of the straps loosened and she momentarily lost her snowshoe, she experienced for herself why they’re a good idea in deep snow. While she picked up some new skills, I suspect that I’m the one who learned the most needed lessons. I think she’ll give me, and snowshoeing, another chance. • Other Great Kids, Great Outdoors posts about snowshoeing: "'Snowshoe School' at AMC's Highland Center" and "Snowshoeing Fun and Games for Kids." • AMC Outdoors articles on selecting snowshoes from Matt Heid (“Powder Power”) and Michael Lanza (“Making Tracks: How to Choose the Right Snowshoes for You”). Lanza gives specific advice about finding snowshoes for children.